The scenery of Capitol Reef National Park along UT 24 is spectacular enough, as here high cliffs rise above while the clear waters of the Fremont River run alongside, and there are several hikes and viewpoints easily accessible including the overlook of the Goosenecks of Sulphur Creek, and paths to Grand Wash, Hickman Bridge, the Rim Overlook and Chimney Rock Canyon. 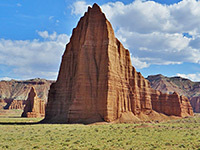 The 10 mile scenic drive side road passes more places of interest and ends at the mouth of Capitol Gorge, along which an easy trail leads right through Capitol Reef. An unpaved road continues south to Sleeping Rainbow Ranch then deteriorates to a rough 4WD track that exits the park and climbs up through the Dixie National Forest to UT 24 (the ranch is named after the original Navajo name for this area; Land of the Sleeping Rainbow). 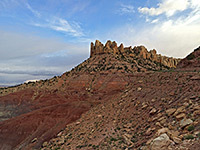 But the two main routes into the backcountry are both east of the reef; the Notom-Bullfrog road south of UT 24 and the Cathedral Valley roads to the north. 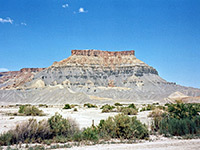 Notom is a settlement of a few scattered houses beside Pleasant Creek, three miles from UT 12. 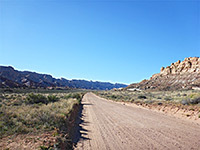 The road is paved to this point and for another seven miles (to just beyond the crossing of Fivemile Wash) then gravel or hard-pressed dirt for the next 30 miles south, becoming paved once more towards the far end, which joins UT 276 near Bullfrog Marina, just inside the boundary of the Glen Canyon National Recreation Area. The surface is always good, with only a few minor rough spots but the road is likely to be more treacherous after recent rains. The drive is very scenic - to the west are great views of the domes and canyons of the Waterpocket Fold, and around the half-way point is Strike Valley, a stark landscape of long, steeply-inclined strata rising abruptly above the flat desert floor. 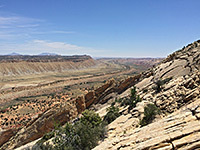 Towards the far end of the national park, the road meets the Burr Trail, which climbs to the top of the reef via a particularly steep, testing series of switchbacks, crosses a pleasant valley beyond and enters the Grand Staircase-Escalante National Monument. 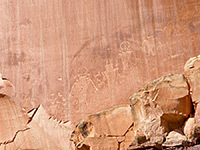 The chief attraction in this area of Capitol Reef National Park is Muley Twist Canyon, a long narrow gorge that can be explored for many miles both north and south. The upper (north) section of the canyon is followed by a 4WD track for 2.5 miles, linking with a half mile trail to Strike Valley Overlook, a spectacular viewpoint 800 feet above the valley floor. There are many other places worth exploring along the Notom-Bullfrog road - narrow canyons, arches and natural bridges, petroglyphs and high peaks - although journeys to most are quite strenuous and may require overnight trips. The land east of the road, a wide plateau beneath the distant Henry Mountains, including the flat lands of Tarantula Mesa and Swap Mesa, seems to have much less of interest. The valley is a distant region where eroded buttes and pinnacles stand high above a flat desert plain - a place similar to Monument Valley but with almost no visitors. 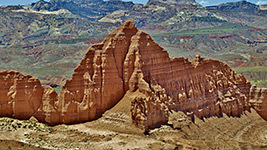 It lies partly within Capitol Reef and extends beyond the park boundaries towards the Moroni Slopes at the edge of the San Rafael Swell. There are two access roads, both of which usually require a 4WD vehicle; the river ford route that crosses the Freemont River before heading north and so is passable only after times of low rainfall, and a longer route (Caineville Road) that leaves UT 12, 7 miles further east and follows the course of several (usually) dry washes, crossing into the national park after 19 miles. Both these roads eventually link with other tracks in the Fishlake National Forest. After the Capitol Reef visitor center turn-off, UT 24 runs eastwards alongside the Freemont River, passing side canyons and steep cliffs. At one point there is a small waterfall with smooth rocks either side and a deep pool below, which is popular for bathing in the summer. From the east park boundary, the road continues for 30 miles to the small towns of Caineville and Hanksville from which one can either go north to I-70 and Green River or south to Hite, at the upper end of Lake Powell. 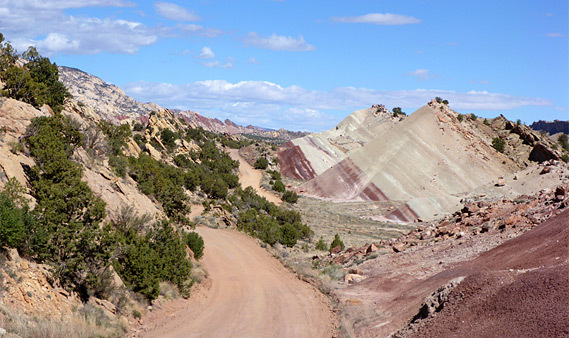 This section of road passes through the Caineville Badlands, one of the most unusual landscapes in the whole state - barren mesas and small cliffs of ashen grey-blue rocks with no trace of vegetation but occasional streaks of yellow or red, that resemble the surface of the moon. It is empty, desolate and uninhabited but also very beautiful.